There is now an iPhone game that allows you to play drums against Animal from The Muppet Show. Truly we live in an age of wonders. Walt Disney has released The Muppets Animal Drummer on the iTunes App Store, allowing players to rock out with the world's greatest practitioner of the drumming art. You can play through classic mode, or import your own tunes in free play mode, and there's even a record function that saves your performance so Animal can reproduce it in his signature style. 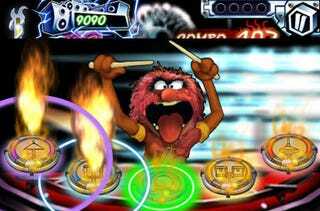 The Muppets Animal Drummer is now available for purchase for a mere $1.99. I'm going to go ahead and call it: this is the iPhone's killer app.